…in a good way. The backstory begins with artist Ray Ferrer’s blog. I came across his blog about a year ago and I love his spray-painted art pieces. Over the last year, I’ve wanted to commission a painting but could never decide on the subject. Recently Ray offered discounted custom prints so I immediately started going through photos to see which one would make a perfect addition to our home. His work has an edge to it and I found several photos I would love to see on our walls. 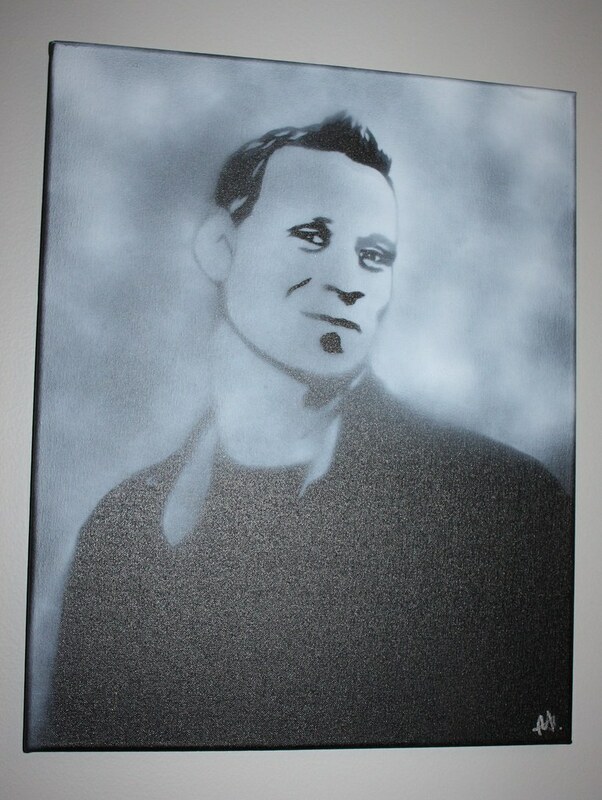 But as I went through my photos, I kept thinking how wonderful a spray-painted portrait of my brother-in-law Frankie, who died tragically in a motorcycle accident this past September, would look in my in-law’s home. Frankie was an edgy guy with a great sense of humor and Ray captured him on canvas. As stated on his blog: “The work is raw, it’s stripped back, it’s honest”. Raw and honest is a good was to describe how I felt when I saw the final work. And so I’m told I made my mother-in-law cry when she saw it too. What a tremendous beautiful gift you did for your mother-in-law!!! This sure made me wonder again why I survived my wreck in October. I’m so sorry for your family’s loss. Truly … and what a thoughtful and beautiful gift! Life is strange, isn’t it?! And so precious. Thank goodness you survived your accident!! What a thoughtful gift. The first Christmas without a loved one is always difficult. You have given your mother-in-law something to treasure.The artist did an excellent job. I hope you and your family had a wonderful Christmas. Thank you for your sweet comment. I really admire this artist’s work.